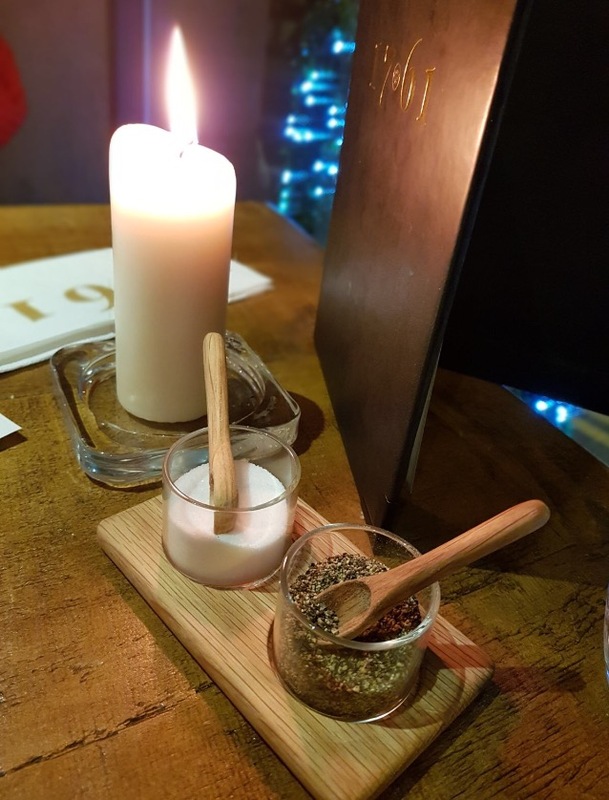 Last Friday evening, myself and my boyfriend head to a brand new restaurant and bar in Manchester, nestled on Booth Street, ideally located on the corner of the main Christmas Market hub. 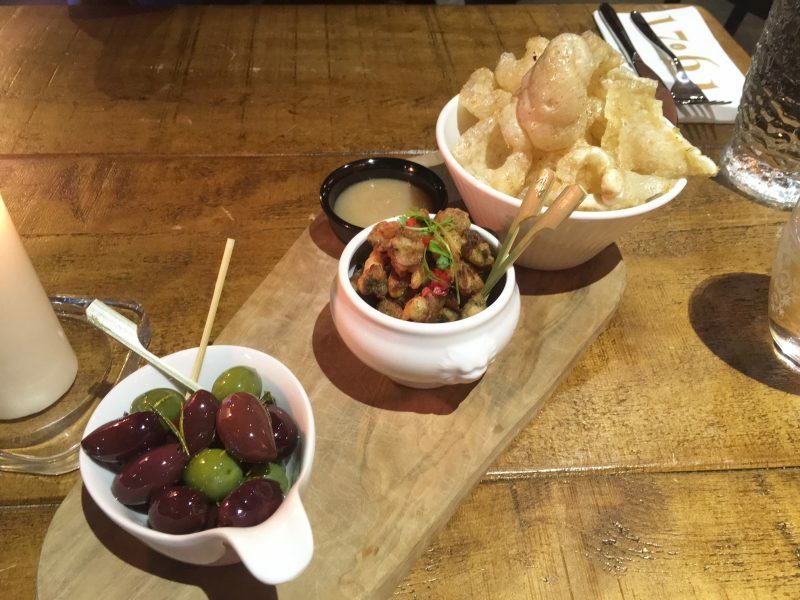 I hadn’t ventured to Manchester city center since all the Christmas lights and markets have popped up all over the place, so what better plan than to to explore the city along with discovering one of the cities newest drinking and dining destinations. 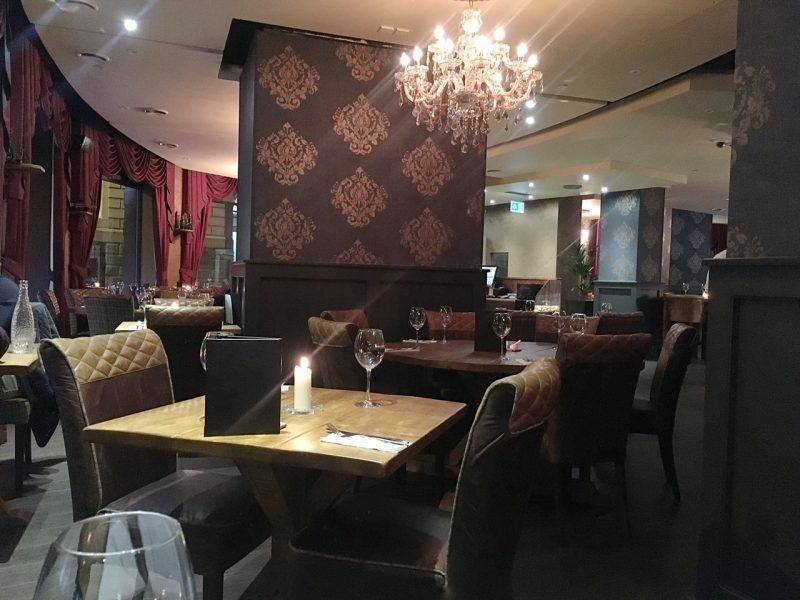 1761 and Lily’s Bar have made home at the old location of Avalanche, a classy Italian which sat on the corner of Booth Street for a couple of years. 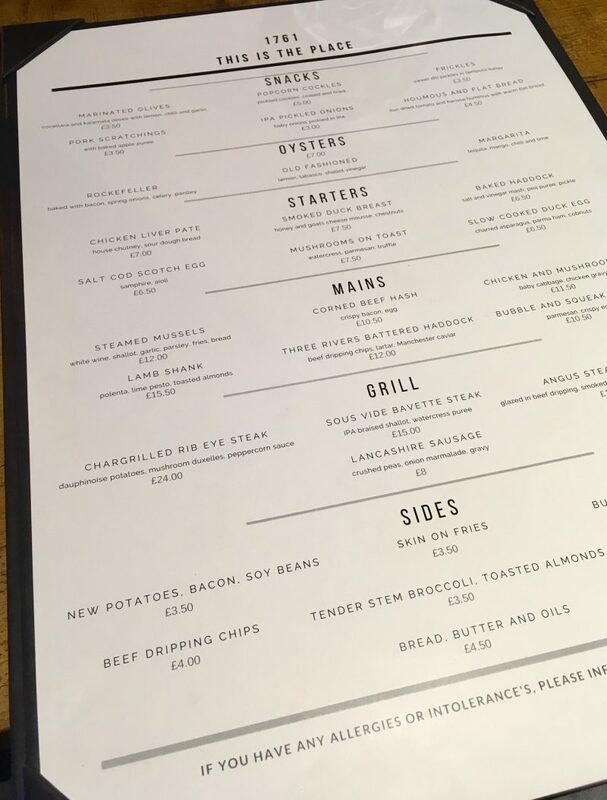 Gracing its presence now is this new take on modern British dining, with strong references to our favourite city, Manchester. It’s joint bar, Lily’s, takes you back in time, to the more glamorous, almost Gatsby-esque days, where elegance was everywhere and 20’s vibes were key. Upon arrival, it was easy to see that 1761 Restaurant pays clear homage to Manchester’s great past. From glancing around the room, you can see how the place draws inspiration from the Industrial revolution, with references to that warm Mancunian spirit which it so notably represents. 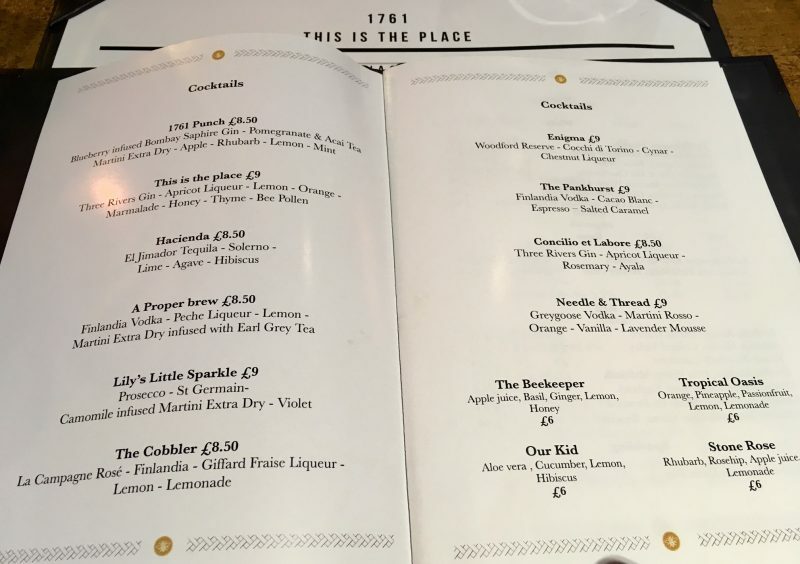 Situated in what I’d class as a perfect location, central to Piccadilly and Spinningfields, 1761 offers brunch, lunch, dinner & drinks with the sole aim of giving a fantastically British experience. Guests can enjoy our modern take on classic British dishes in luxurious old style glamour. And there’s no need to end the evening there – Lily’s bar sits aside to it, where you can happily relax and enjoy a cocktail or a glass of champagne. 1761’s decor is what I would descibe as dark and moody, with that gentlemens feel to it. It really does mentally take you back to a more 20’s era, oozing sophistication and style. So, lets get to the most important factors: the food and drink. However first of all, huge shoutout to our waiter, who was absolutley incredible from start to finish. 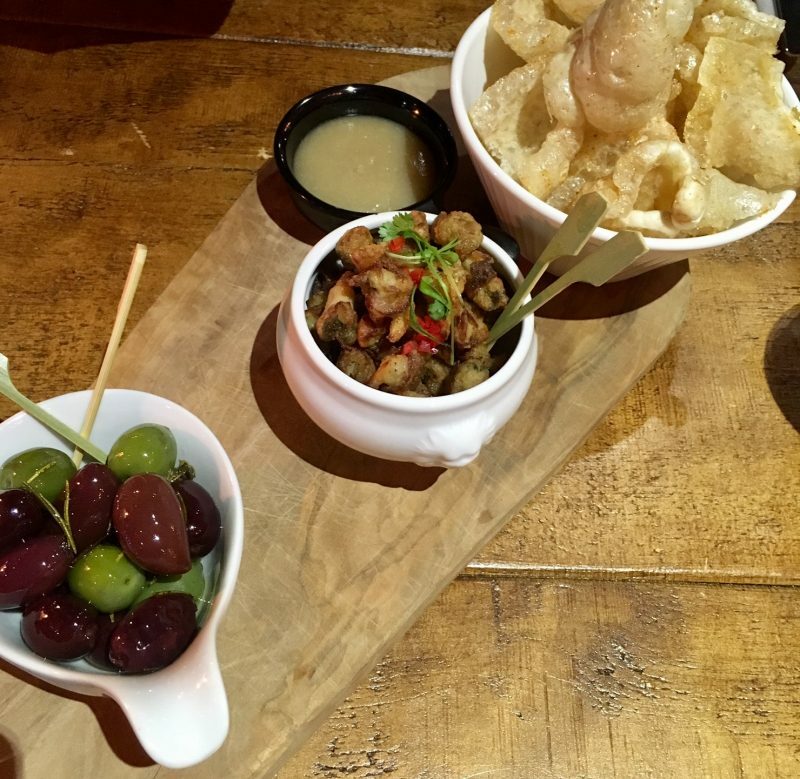 Jamie talked us through everything and made us feel so welcome, and even brought over a selection of their favourite sharing starters before our actual starters (so more like grazing food). 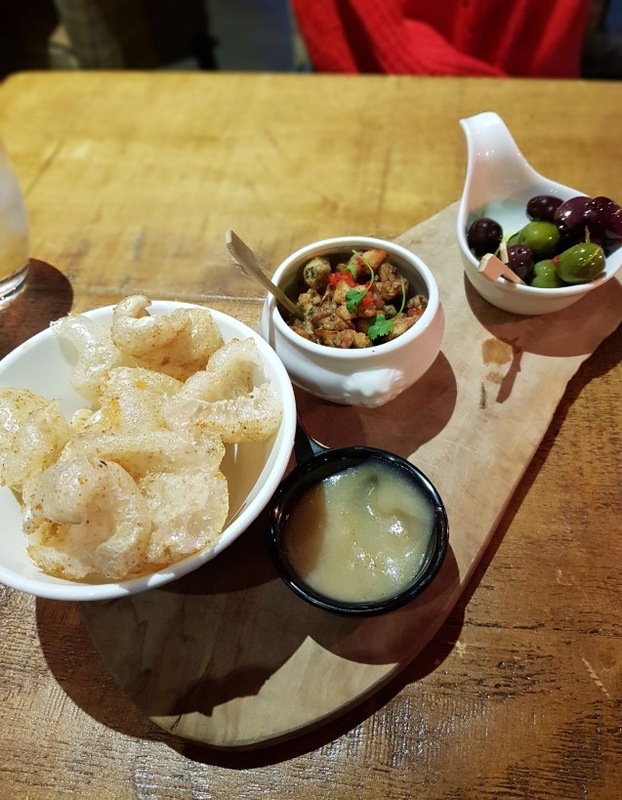 Whilst we browsed the menu, we nibbled on a mixture of marinated green and black olives, popcorn cockles and pork scratchings with baked apple sauce. Before I go any further, the popcorn cockles were absolutely amazing – I’ve never experienced anything like these before! Pickled cockles, coated and friend, tasted soft and full of flavour. They tasted fishy but salty and almost herbed – we actually made a joke to ourselves that they tasted like our favourite starter from the Chinese, salt and pepper fried chicken but with a fish taste instead! Which is a good thing because I literally can’t get enough of salt and pepper chicken. 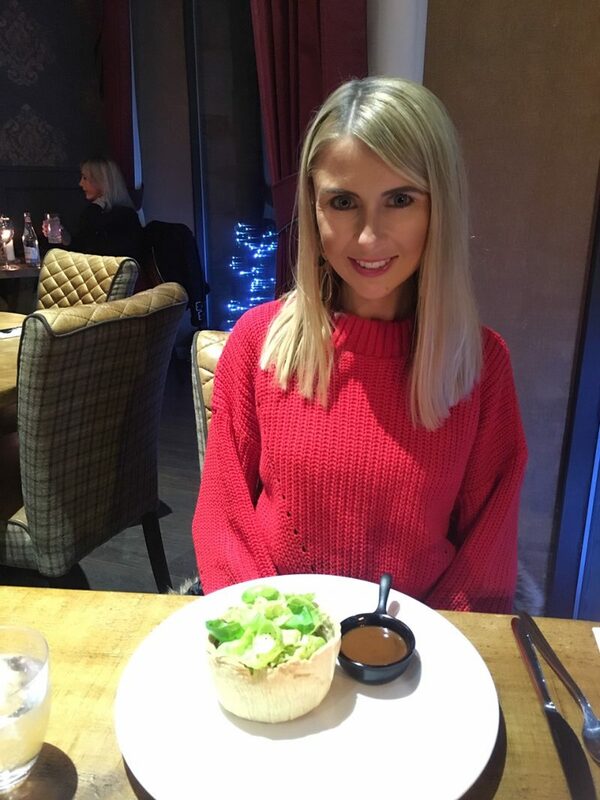 You’ve honestly never seen two people get through the bowl so quick, and I knew i’d re-visit the restaurant even just for the cockles before I’d even ordered the rest of my courses. To ‘properly’ start, I chose the Smoked Duck Breast with Honey Goats Cheese Mousse. 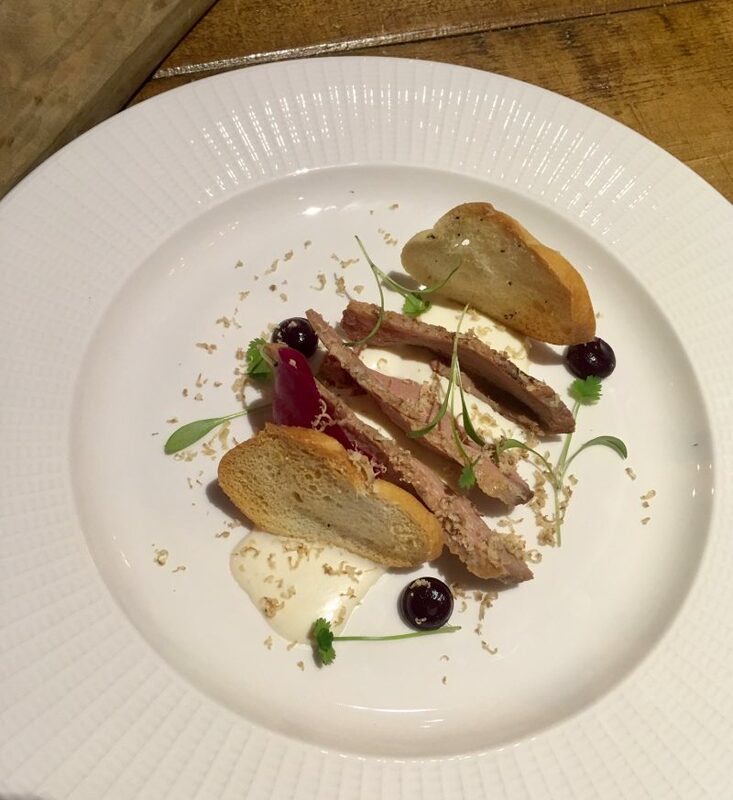 The Duck was delicious, it literally fell apart in my mouth is that soft and well cooked, and the Honey Goats Cheese Mousse gave a strong but sweet touch. 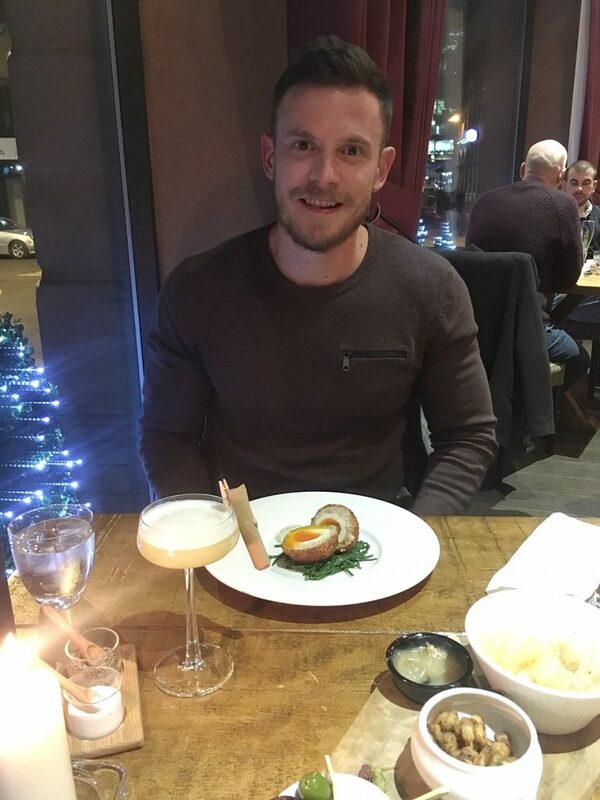 My boyfriend went for the Scotch Egg but made with Salt Cod instead. He was a little dubious about it to begin with, I mean, it’s a modern twist on a British classic for sure. However, when it came it overly impressed us (I say ‘us’ because I always make sure I dig into his meals too!) as it tasted like a tasty fishcake coating an egg, with a light breadcrumb. Definitley worth a try if you like your Scotch Eggs. Before I go onto the main courses and desserts, I owe a passage or two to the drinks situation. 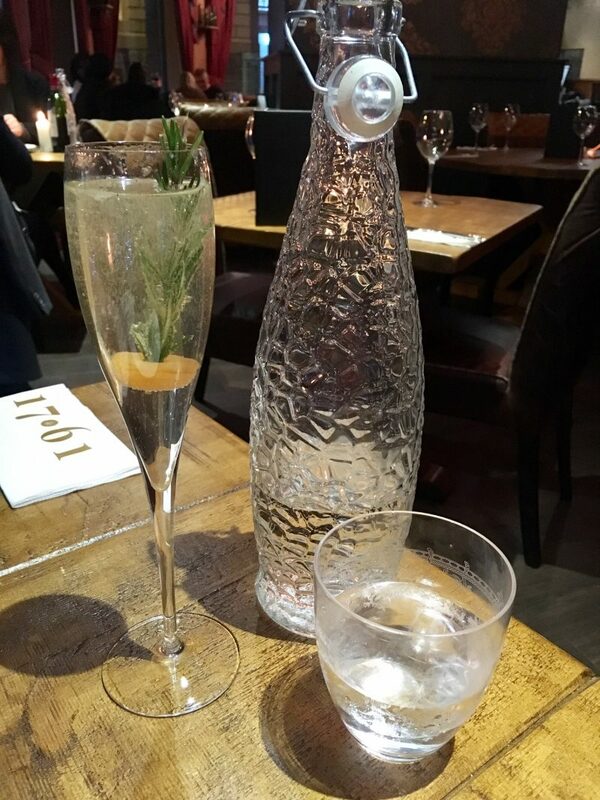 Firstly, they offer a range of exquisite cocktails which I just had to try out first of all. I mean, it would be rude not too, right? 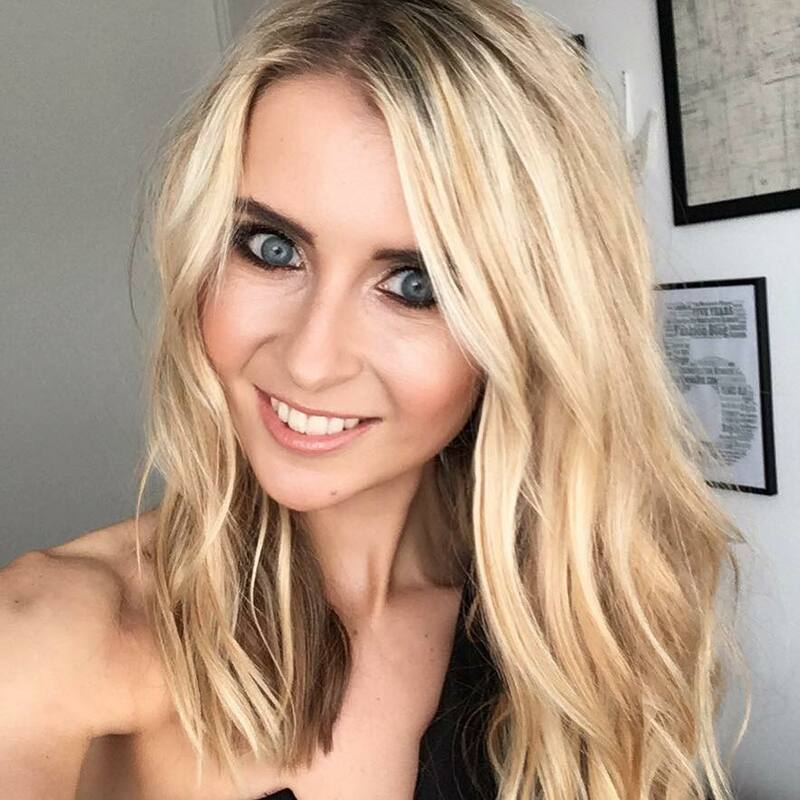 Firstly, I always scan my eyes over a cocktail menu looking for one thing in particular – Espresso Martinis. They are my ultimate favourite cocktail, more so for after dinner drinks than anything else. 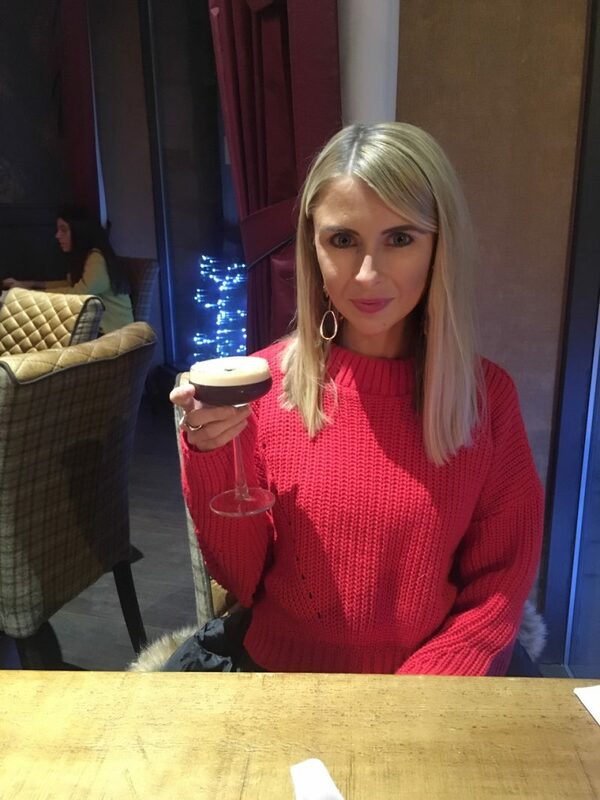 So when I searched the menu and found a slight twist on the classic Espresso Martini on the menu, I was utterly happy. This cocktail in particular also featured on the dessert menu, because as I mentioned before, they make perfect after dinner drinks. This one takes on the traditional Espresso Martini, except it is laced with a little chocolate too, making it more indulgent. Again, the most satisfying treat after I’ve eaten my three course meal. 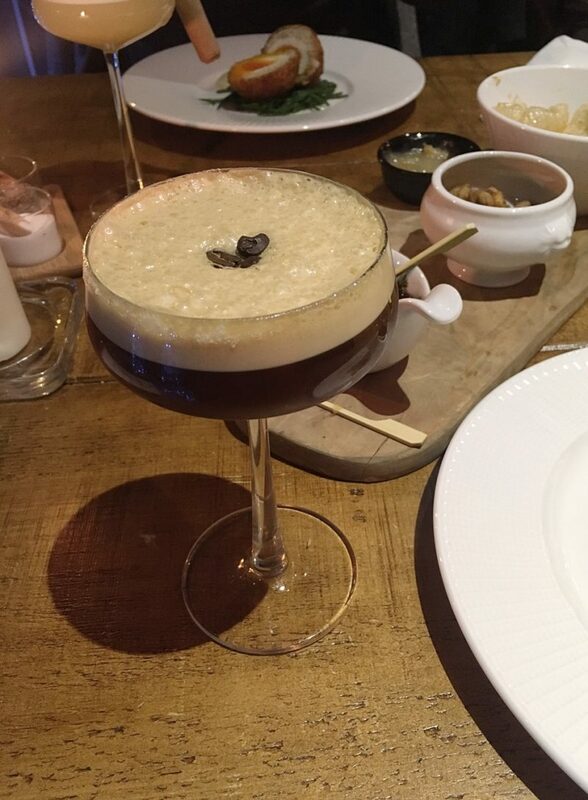 I’ve had many an Espresso Martini before, and trust me, you can get a non-descript one. And there is nothing more disappointing. But these ones are made with the perfect combination of vodka, liqueurs, coffee and chocolate for the smoothest, creamiest and sweetest version. 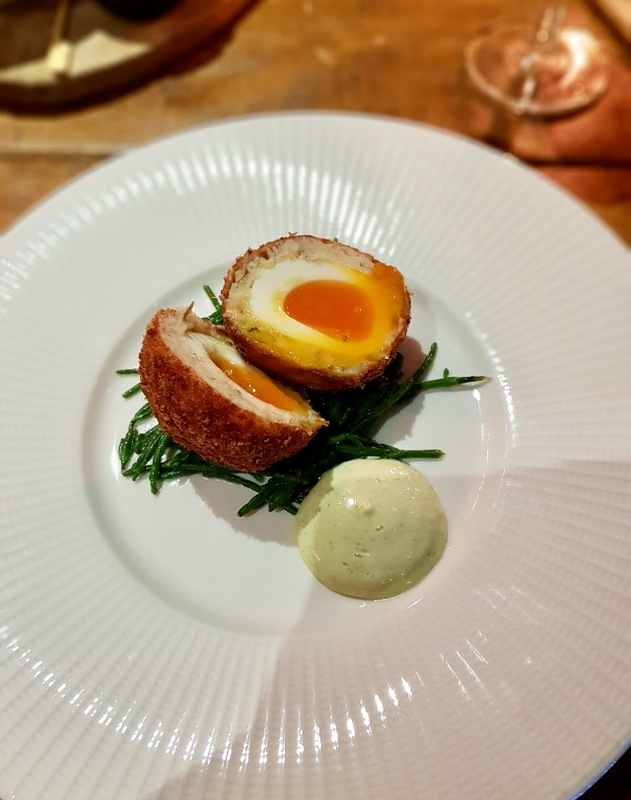 When it came to the mains, it took a while for us to pick, as the offerings were based on classic British favourites, with a modern, ‘sassy’ twist so to speak. There was a Bubble and Squeak Risotto with parmesan and a crispy egg, Lamb Shank with lime pesto and toasted almonds, corned beef hash (I rarely ever see this on a menu and I was ecstatic to see this appear!) and various meats from the grill. In the end, I let my pie addiction get the better of me, and I chose the open lid Chicken and Mushroom pie with baby cabbage and gravy. My word – this has got to be the nicest pastry I’ve tried! So buttery and soft, and also very thick, which is much needed when you have an open top pie! 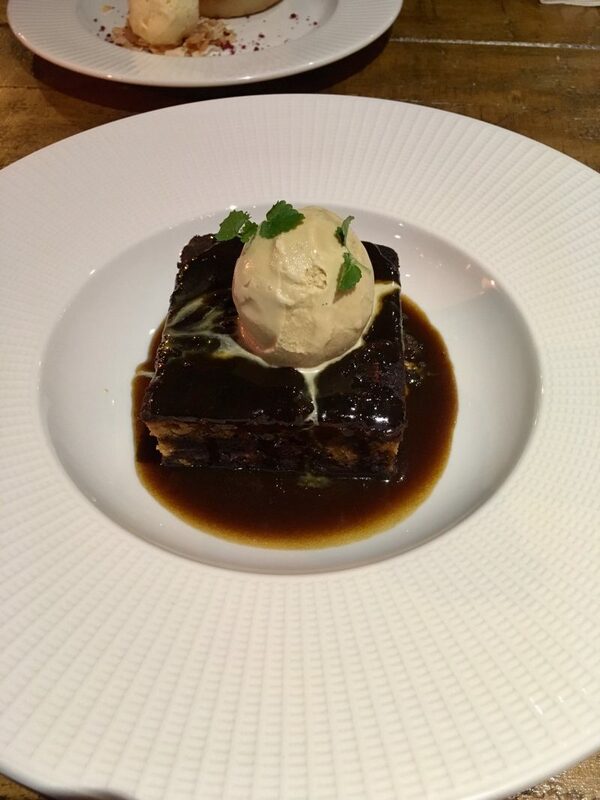 We decided we may as well order desserts to finish off the experience (you know, if we must!). Besides, we thought they would come small sized, as the starters were fairly small. 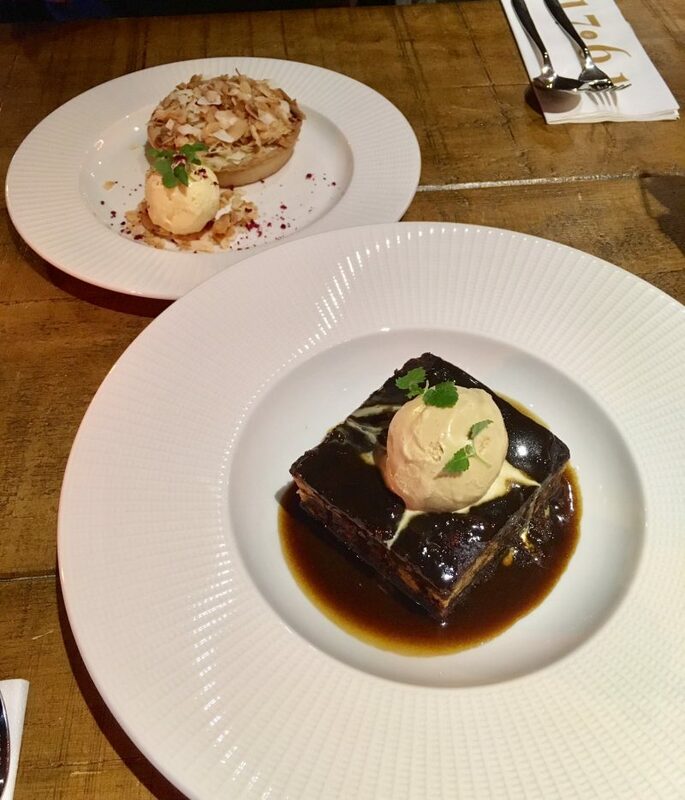 Let me warm you – the desserts are big! 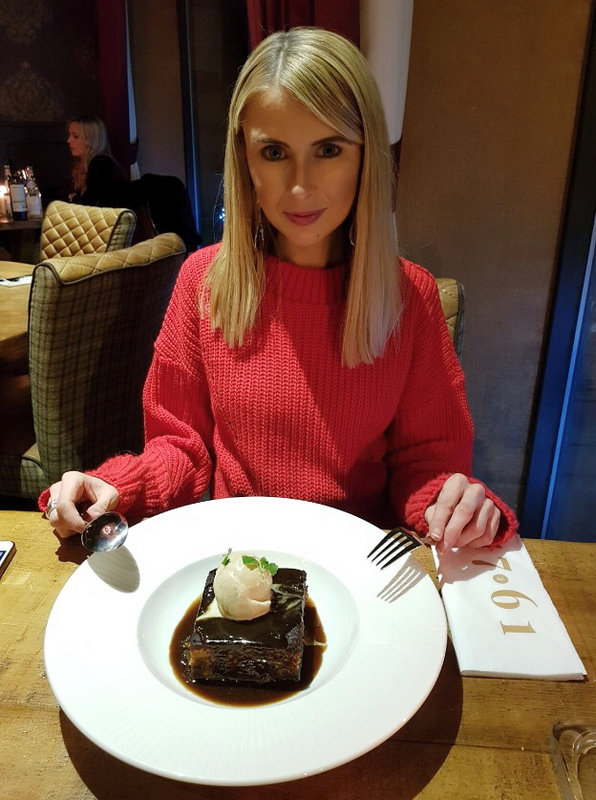 Don’t be fooled into thinking that because 1761 serves up food presented extremely well on the plate, that you’ll get a measly sized portion of cake. 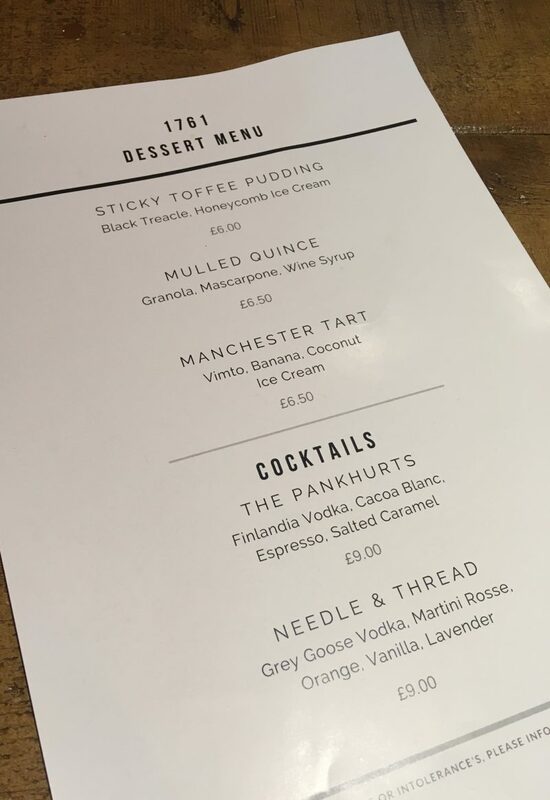 We chose the Manchester Tarte and the Stick Toffee Pudding, and my word, these were incredible. I could rave about them both all day, but I have to give a special mention to the yummy Manchester Tarte. 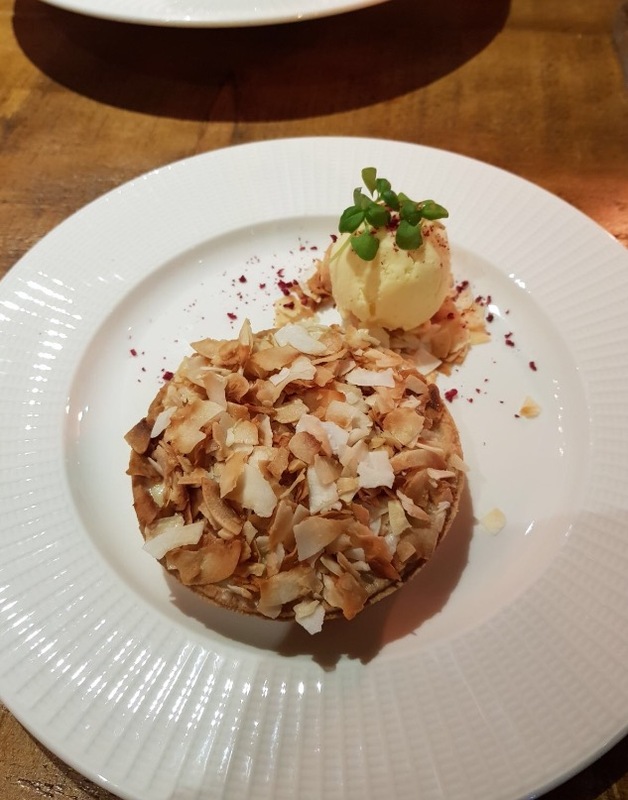 They have basically taken a local sweet and added a touch of vimto jam and banana, muddled with pastry and coconut, and created this genius concoction of the classic. As dense, filling and sweet as it was, I couldn’t put my fork down. Pure heaven in a cake. 1761 is priced more towards the fine dining tier, but you get what you pay for. Service, ambiance, choice and food was all of an excellent standard, and I’d struggle to fault the place. 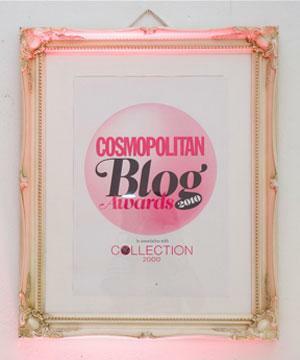 Next Post Beauty: The Best False Eyelashes plus WIN a Lash + Lip Bundle!